Draft: 2009, Arizona Diamondbacks, 3rd rd. Keon Darell Broxton graduated from Lakeland (FL) High School, where he also played football (wide receiver)...Attended Santa Fe Community College...Was a competitive skateboarder as a kid in Lakeland, FL...Was sponsored by a local skate shop that gave him discounted boards and gear...Is a supporter of the Evan Michael Chambers Love Foundation...Also supports Dream Center of Lakeland...Has four Jack Russell terriers named Miley, Mello, G and Bubby Row...Enjoys pancakes and video games. Made 17 starts (11 in center field, six in right field) for Milwaukee...Had three stints with the team (June 26-July 27, August 13-21 and September 1-the end of the season)...Belted a pair of homers with a career-best nine total bases and a career-high-tying four RBI in an 8-2 win on June 29 at Cincinnati...Was the third two-homer performance of his career...Caught the last out of the NL Central tiebreaker game on October 1 at Chicago (Anthony Rizzo fly ball to right field)... Robbed Brian Dozier of a ninth-inning home run on July 4 vs. Minnesota to preserve a 3-1 win...Batted .254 (76-299) with 10 homers, 37 RBI and 27 stolen bases in 82 games at Colorado Springs (AAA) of the Pacific Coast League. Batted .220 with 20 HR, 49 RBI and 21 stolen bases in 143 games... Made 113 starts, all in center field... His 21 stolen bases tied for ninth in the National League... Became just the eighth player (13x) in franchise history to produce a 20/20 season as he joined Ryan Braun (4x), Carlos Gómez (2x), Corey Hart (2x), Tommy Harper, Jeromy Burnitz, Robin Yount and Marquis Grissom... First 14 games: .119 (5-for-42, 1hr, 2rbi).....Next 28 games: .337 (34-for-101, 4hr, 12rbi)... Next 16 games: .082 (4-for-49, 1hr, 2rbi).....Next 16 games: .353 (18-for-51, 7hr, 16rbi)...Next 19 games: .057 (3-for-53, 1hr, 4rbi).....Next 17 games: .314 (16-for-51, 6hr, 11rbi)... Last 33 games: .164 (11-for-67, 0hr, 2rbi)... Had three career-high 7-game hitting streaks (5/7-5/14, 5/16-5/25 and 6/15-6/21)... Was optioned on 7/22 to Triple-A Colorado Springs (7g, .385, 1hr, 7rbi, 4sb) and recalled on 8/1... Made a game-ending catch of a possible Randal Grichuk 2-run homer in the ninth inning on 8/30 vs. St. Louis.....Brewers won, 6-5... Scored 4 runs in a 15-2 win on 9/9 at Chicago-NL, tying a franchise record (now done 61x). Batted .242 with 9 HR, 19 RBI and 23 stolen bases in 75 games during his first season with Milwaukee.....made 58 starts, all in center field...Made his first career Opening Day roster...Had four stints with the Brewers (Opening Day-4/16, 5/20-6/3, 6/10-7/3 and 7/25-end)...Became the sixth rookie in franchise history to register 20+ stolen bases in a season, joining Paul Molitor, Pat Listach, Alex Sanchez, Scott Podsednik and Norichika Aoki...Batted just .125 (8-for-64, 1hr, 2rbi) over his first 29 games and .294 (42-for-143, 8hr, 17rbi) over his last 46 games after being recalled on 7/25...Recorded his first Major League hit on 5/25 at Atlanta with a bunt single off Casey Kelly.....it snapped an 0-for-24 streak to start his career...Belted his first Major League home run on 6/24 vs. Washington with a pinch-hit solo shot off Max Scherzer.....also hit a pinch-hit homer on 8/5 at Arizona (solo off Braden Shipley)...Became the first Brewers rookie to produce a 5-hit game on 8/6 at Arizona, going 5-for-5 with a run, double, 2 RBI, a walk and a stolen base...Suffered a season-ending right wrist fracture on 9/16 at Chicago-NL (running into the wall)...Batted .287 with 8 HR, 26 RBI and 18 stolen bases in 47 games at Triple-A Colorado Springs. Entered 2015 rated by Baseball America as the best defensive outfielder in the Pirates system…Batted a combined .273 with 10 HR, 68 RBI and 39 stolen bases in 133 games between Double-A Altoona (45g) and Triple-A Indianapolis (88g)…His 39 stolen bases ranked second in the Pirates organization…Produced 20+ stolen bases for the fifth time in his seven professional seasons…Tied for third in the International League in triples (8)…Contract was selected by Pittsburgh on 9/21.....appeared in 7 games, all coming off the bench…Made his Major League debut on 9/21 at Colorado, entering as a pinch-runner (SB, run)…Was traded to Milwaukee, along with RHP Trey Supak, for 1B Jason Rogers on 12/17. Spent the entire season with Single-A Visalia and hit .267(131-for-490) with 24 doubles, 19 homers and 62 RBI...Tied for the team lead in doubles, ranked second in totalbases (214), third in home runs (19), stolen bases (21), RBI (62) and runs scored (84)...Batted .333 (42-for-126)in his final 31 games after hitting.245 (89-for-364) in his first 99...Appeared in 6 games during the postseason with Triple-AReno and went 3-for-14 (.214) 1 home run and 2 RBI...was 2-for-4 with a homer and 2 RBI in the Aces' 10-3 win in the Triple-A National Championship Game on Sept. 18 vs. Pawtucket...Entered the season cited by Baseball America as the Best Athlete in the D-backs' organization. Combined to hit.248 (120-for-484) with 14 doubles, 7 triples, 7 home runs and 45 RBI in 130 games with Single-A South Bend and Visalia...ranked third in the D-backs' organization with 33 stolen bases...Began the season with the Silver Hawks and batted .231(18-for-78) with 2 triples and 1 RBI in 20 games...was promoted to the Rawhide on April 30...Appeared in 110 games with Visalia, hitting .251 (102-for-406) with 14 doubles, 7 homers and 44 RBI...Entered the season ranked by Baseball America as the No. 10 Prospect in the D-backs organization. Played in 133 games with South Bend and hit .228 (121-for-531) with 17 doubles, 19 triples, 5 home runs and 32 RBI in 133 games...Led all Minor Leaguers in triples, 3 more than Brett Lawrie (16) and Francisco Peguero (16). Hit .246 (67-for-272) with 11 doubles, 9 triples, 11 homeruns and 37 RBI in 72 games with Advanced Rookie Missoula in his first pro season...Ranked among the Pioneer League leadersin triples (1st),home runs (T-7th), total bases (T-7th, 129) and slugging percentage (.474). January 5, 2019 Milwaukee Brewers traded CF Keon Broxton to New York Mets for RHP Adam Hill, RHP Bobby Wahl and 2B Felix Valerio. September 1, 2018 Milwaukee Brewers recalled CF Keon Broxton from Wisconsin Timber Rattlers. August 29, 2018 Wisconsin Timber Rattlers activated CF Keon Broxton from the temporarily inactive list. 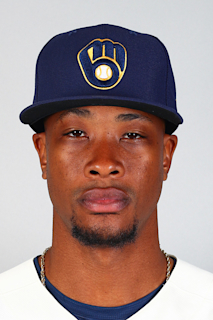 August 22, 2018 Milwaukee Brewers optioned CF Keon Broxton to Wisconsin Timber Rattlers. August 13, 2018 Milwaukee Brewers recalled Keon Broxton from Colorado Springs Sky Sox. July 28, 2018 Milwaukee Brewers optioned CF Keon Broxton to Colorado Springs Sky Sox. June 26, 2018 Milwaukee Brewers recalled Keon Broxton from Colorado Springs Sky Sox. March 24, 2018 Milwaukee Brewers optioned CF Keon Broxton to Colorado Springs Sky Sox. August 1, 2017 Milwaukee Brewers recalled Keon Broxton from Colorado Springs Sky Sox. July 22, 2017 Milwaukee Brewers optioned CF Keon Broxton to Colorado Springs Sky Sox. July 25, 2016 Milwaukee Brewers recalled Keon Broxton from Colorado Springs Sky Sox. July 4, 2016 Milwaukee Brewers optioned CF Keon Broxton to Colorado Springs Sky Sox. June 10, 2016 Milwaukee Brewers recalled Keon Broxton from Colorado Springs Sky Sox. June 3, 2016 Milwaukee Brewers optioned CF Keon Broxton to Colorado Springs Sky Sox. May 20, 2016 Milwaukee Brewers recalled Keon Broxton from Colorado Springs Sky Sox. April 17, 2016 Milwaukee Brewers optioned CF Keon Broxton to Colorado Springs Sky Sox. December 17, 2015 Milwaukee Brewers traded 1B Jason Rogers to Pittsburgh Pirates for CF Keon Broxton and RHP Trey Supak. September 21, 2015 Pittsburgh Pirates selected the contract of CF Keon Broxton from Indianapolis Indians. May 29, 2015 CF Keon Broxton assigned to Indianapolis Indians from Altoona Curve. January 9, 2015 Pittsburgh Pirates invited non-roster CF Keon Broxton to spring training. June 25, 2014 Altoona Curve activated CF Keon Broxton. June 22, 2014 CF Keon Broxton roster status changed by Altoona Curve. March 27, 2014 Arizona Diamondbacks traded CF Keon Broxton to Pittsburgh Pirates for cash. March 27, 2014 CF Keon Broxton assigned to Altoona Curve. October 3, 2013 Arizona Diamondbacks sent OF Keon Broxton outright to Mobile BayBears. September 30, 2013 Arizona Diamondbacks recalled Keon Broxton from Mobile BayBears. May 4, 2013 Keon Broxton assigned to Mobile BayBears from Reno Aces. April 2, 2013 Keon Broxton assigned to Reno Aces from Mobile BayBears. March 13, 2013 Arizona Diamondbacks optioned Keon Broxton to Mobile BayBears. November 19, 2012 Arizona Diamondbacks selected the contract of Keon Broxton from Reno Aces. September 4, 2012 Keon Broxton assigned to Reno Aces from Visalia Rawhide. March 3, 2012 CF Keon Broxton assigned to Arizona Diamondbacks. April 30, 2011 Keon Broxton assigned to Visalia Rawhide from South Bend Silver Hawks. March 7, 2011 OF Keon Broxton assigned to Arizona Diamondbacks. April 5, 2010 Keon Broxton assigned to South Bend Silver Hawks from Missoula Osprey. March 14, 2010 OF Keon Broxton assigned to Arizona Diamondbacks. June 22, 2009 Keon Broxton assigned to Missoula Osprey from Arizona Diamondbacks. June 20, 2009 Arizona Diamondbacks signed Keon Broxton.